The map reflects year-to-date, not quarterly numbers. The Orange County office market market fairs well compared to the entire Southern California office market, with average vacancy rates across Classes A, B and C, comparable to Los Angeles and San Diego counties at 11.2%, down from 11.8% the previous quarter. Average Class A office space in Orange County currently suffers from the highest vacancy rate at 13.1%. However this is a big improvement from the previous quarter of 15%, reflecting significant Class A lease absorption in Q3 2018. Orange County also compares well on average asking office rents compared to the rest of the Southern California office space market, at $2.78 PSF/mth full service gross, up from $2.72 the previous quarter. Average asking Orange County Class A rents are approximately 10% below those of Los Angeles County and San Diego County. The average vacancy rate for Class C office, the most affordable office class, is still low across the entire Southern California office space market, at approximately 6.4%, up from 5% the previous quarter. This is due to significant increases in asking office rents over the past few years, driving small businesses towards the cheapest deals, with an average asking Class C lease rate as low as $1.91 PSF/mth in Orange County. 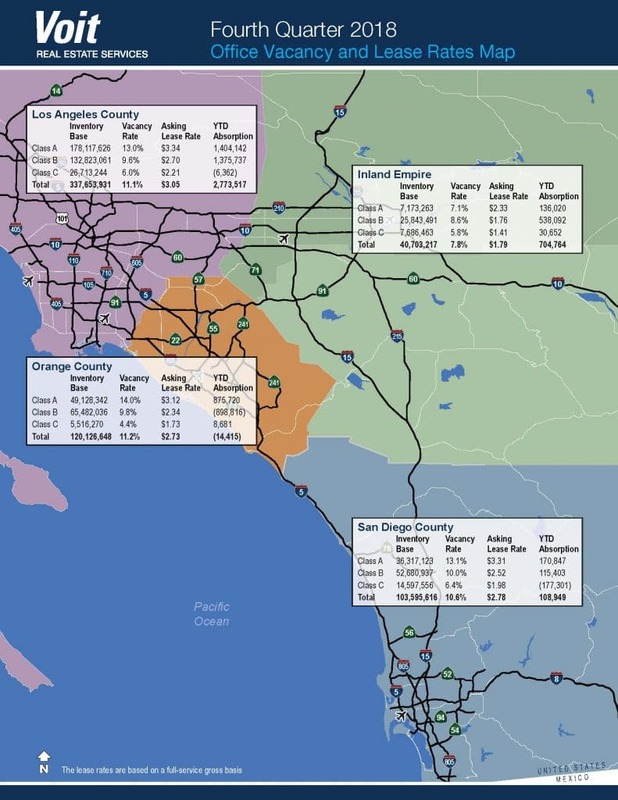 This data clearly shows opportunities for value plays in Class A office space in Orange County, We’re generally seeing a shift from Class A to new low rise product in the Orange County office market, so there are still plenty of value deals to be had in Class A’s if you can find them. In summary, focusing on Orange County, we continue to see steady rental growth and absorption across all office building classes as job growth and the OC economy continues on an upward trajectory. View a PDF ofthe Southern California Office Market Vacancy & Lease Rates Map. Voit’s Orange County Office Market Report Q3 2018 – Just Released! 0 Comments on "Just Released! Voit’s Q4 2018 Southern California Office Space Market Vacancy & Rents Map"